Happy day stampers and welcome to another video tutorial here at Mrs. Lincoln's Inkin'!! 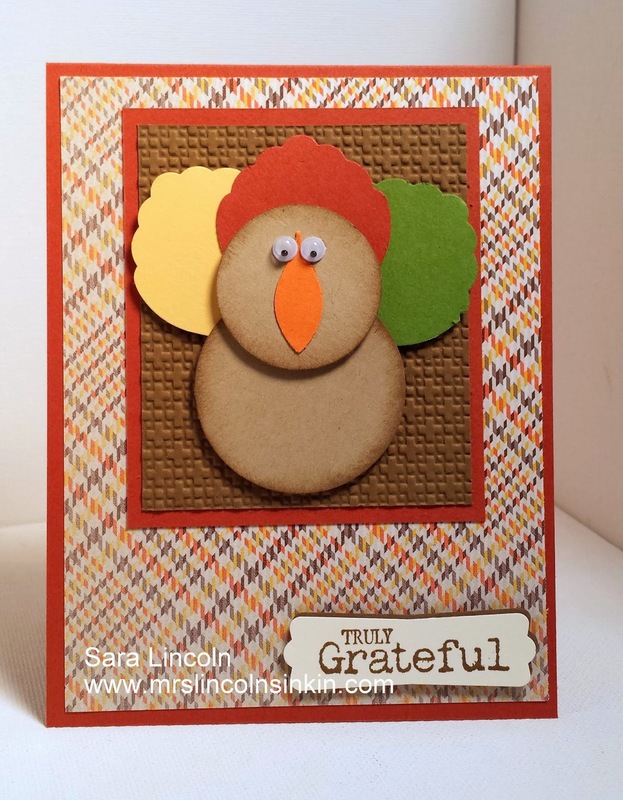 Earlier this week i posed this cute Punchy Turkey and i had a few people on different sites that i post too ask me how i made him (thank you so much for those of you that asked!!! ), so i thought i would do a short video on how I made him for you. Now, before i get started I do wanted to point out that some of the items that i used are retired (boo hoo) such as the blossom punch (that is what i call it in the video) that i used for his feathers and the googlie eyes, but i just love the way that he turned out ( i originally made him for my daughters scrap book and wasn't planning really on sharing him but couldn't help myself, lol). I am sure that you could use anything really that has some sort of scallop, and if anyone CASE's him with a different product, i would LOVE to see what you came up with!!!! Let's go ahead and take a look at the video. If you want to see my complete supply list for my previous post this week, on everything i used to make the card pictured above, please click HERE. Now a quick reminder of the great promotion that SU! is offering right now. To help continue to celebrate the Best Of 25 Years, they are offering 25% off 25 selected stamp sets!!!! Click on the picture above to see a complete list of the 25 sets that are included in this great special offer. Only available until October 28th so don't wait!!! !